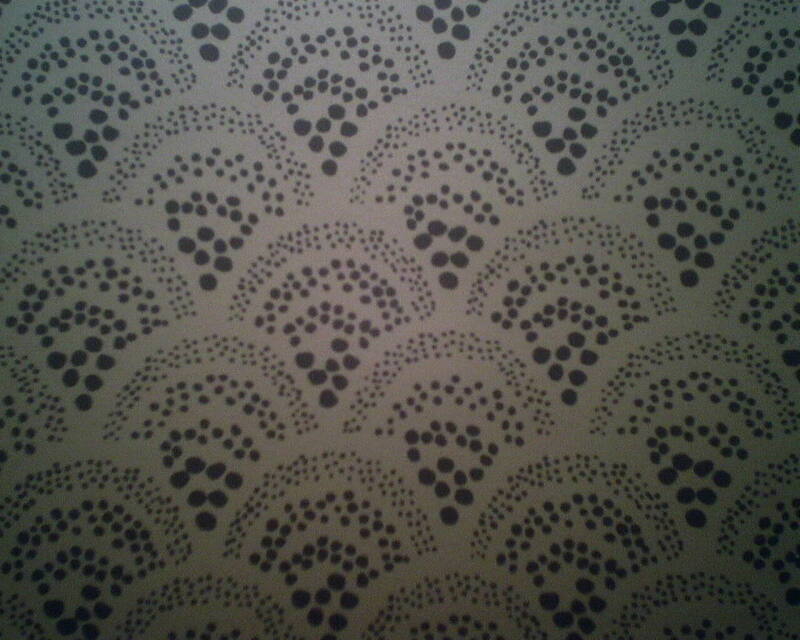 I hung this paper in a master bathroom back in 2001, and it has held up very nicely. 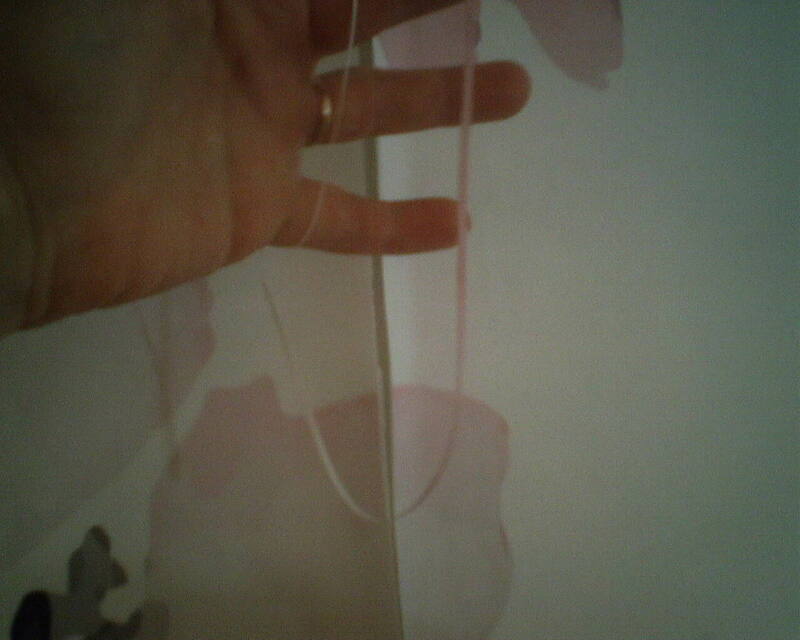 But if you look closely, you can see that the seams are “pouched” up just a little. 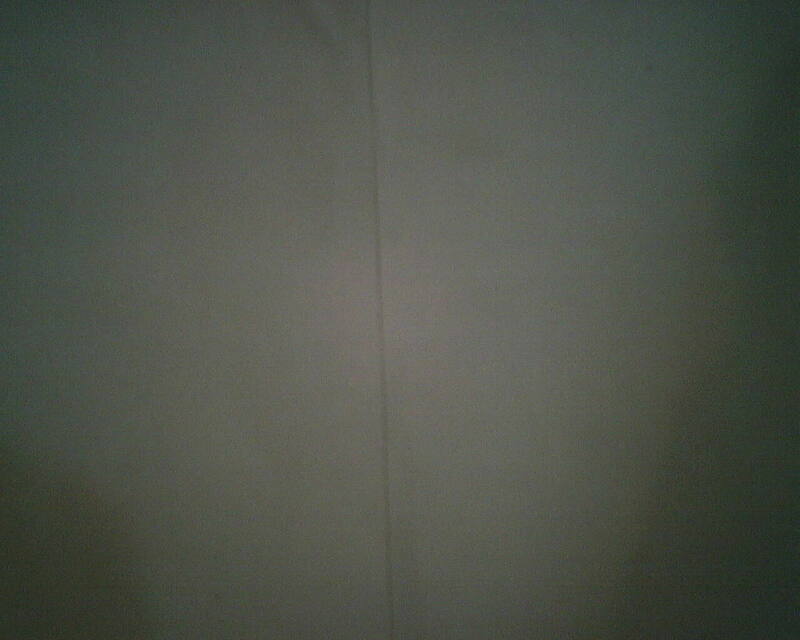 This is a type of paper called paper-backed solid vinyl, and often comes pre-pasted, and is usually toward the lower end of the price point. 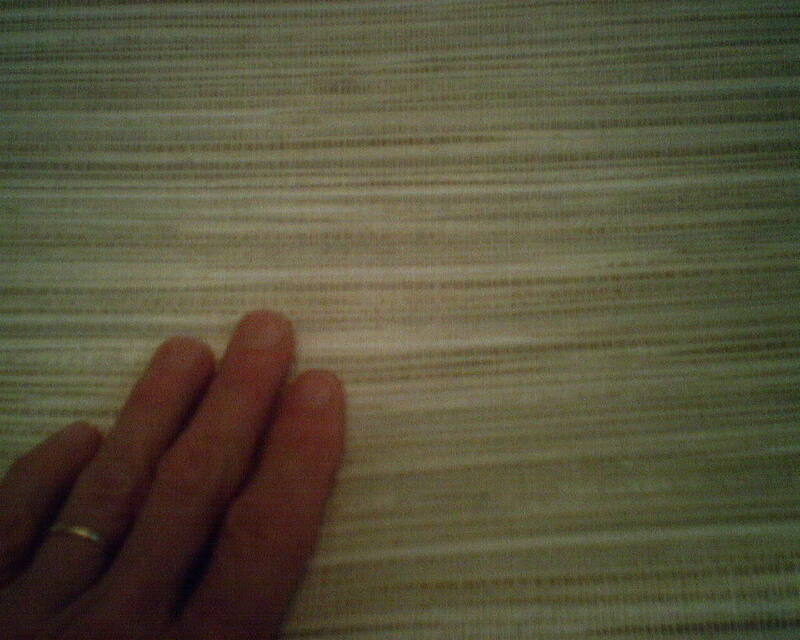 I don’t like these papers because they have a habit of doing just this – curling every so slightly at the seams. The reason, I believe, is that humidity gets into the seams and then into the paper backing. The paper swells, and the vinyl surface has nowhere to go, so it curls backwards on itself. 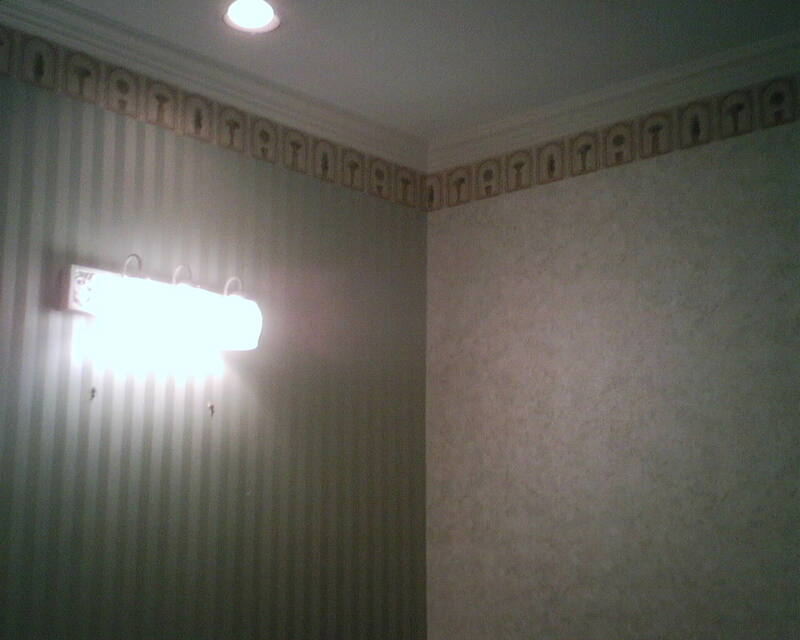 Better alternatives are acrylic-coated papers, or the newer non-woven wallcoverings. 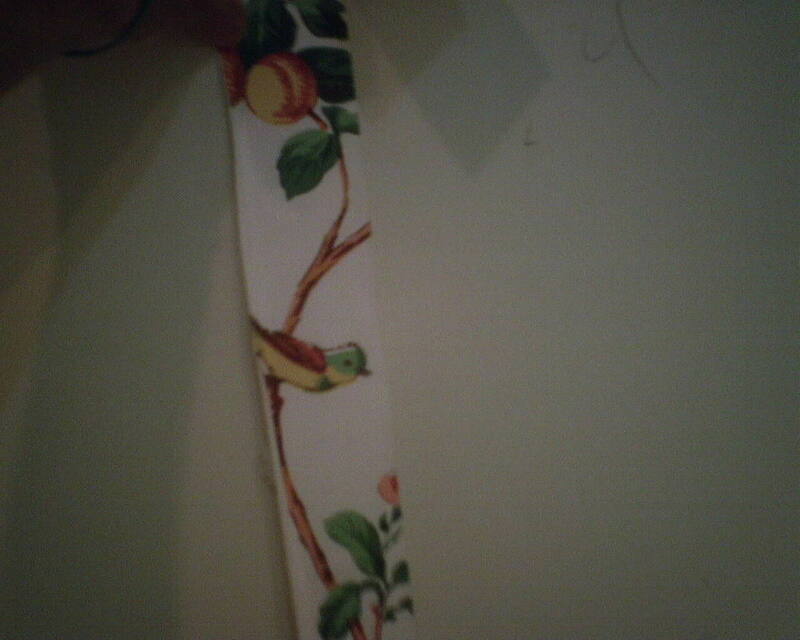 Here I have stripped off the top vinyl layer of a wallpaper I hung 16 years ago. 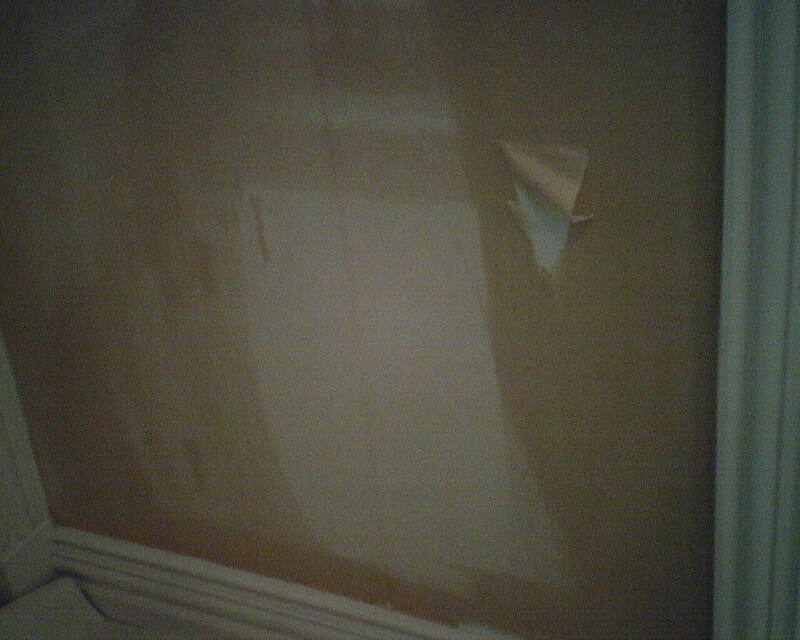 The tan colored paper backing is still left on the wall. 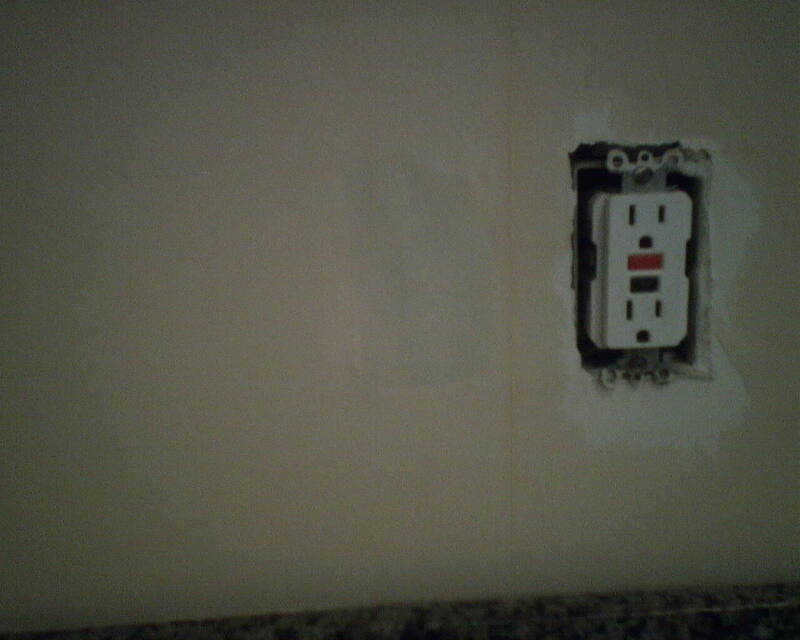 See the shadow of a rectangular hole in the wall, to the left of the electrical outlet? That is where a box was put in the wall but was not used – and old telephone line, perhaps, or cable or the like. 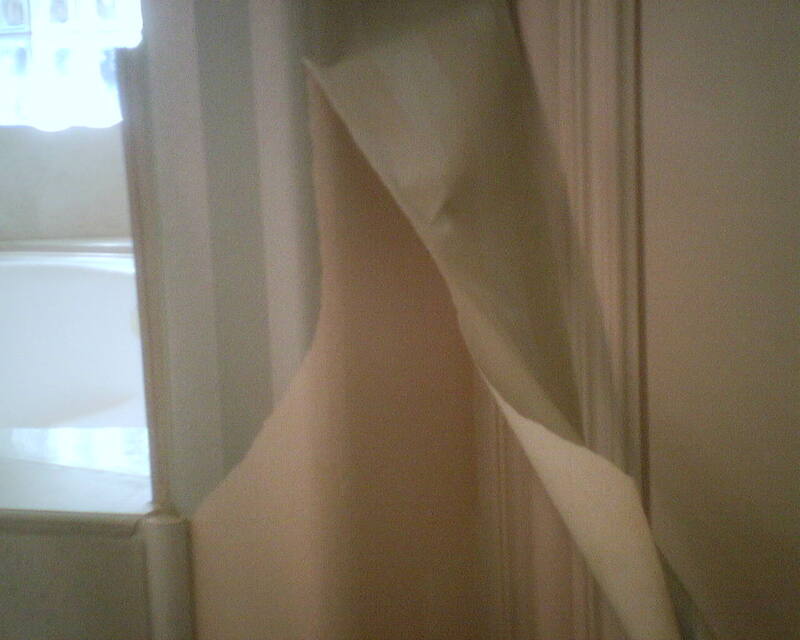 Rather than cut the wallpaper around the opening and then slap a dummy cover on it, I elected to put the wallpaper right over the hole. It looks much neater. And if anyone ever wants to access the box, it’s there, and can be opened easily. 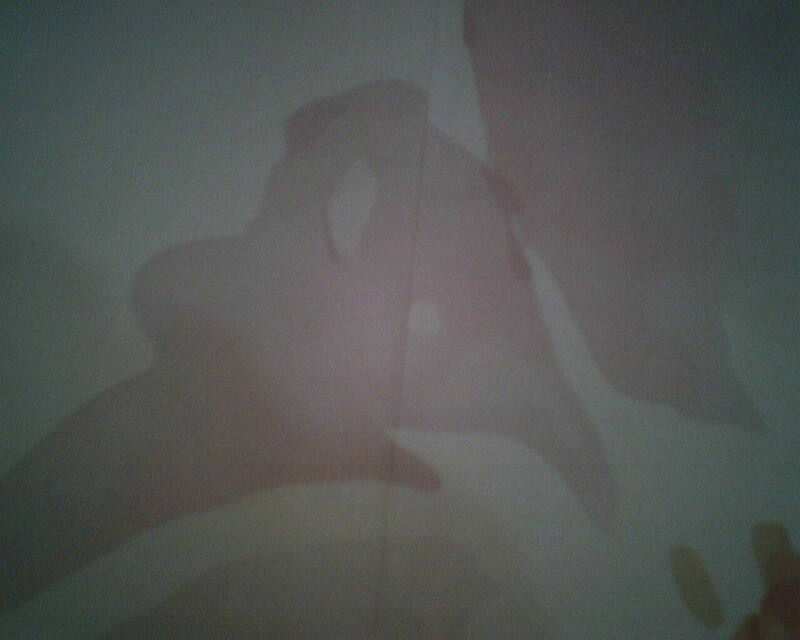 Here’s a tiny sliver of one of the papers I stripped off a hall bathroom yesterday. It’s awfully pretty, but it’s a little outdated, and may not be to the taste of shoppers for this home. So it was stripped off, and the walls will be painted, to make the home as neutral as possible, and hopefully do better on the market. 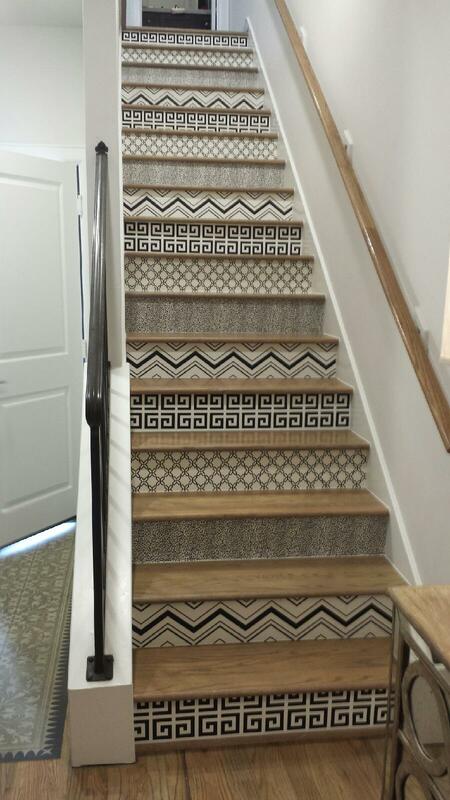 The homeowners have put this Bellaire (Houston) house on the market, but it has not been attracting much attention, and the realtor says it’s partially due to the outdated wallpaper. 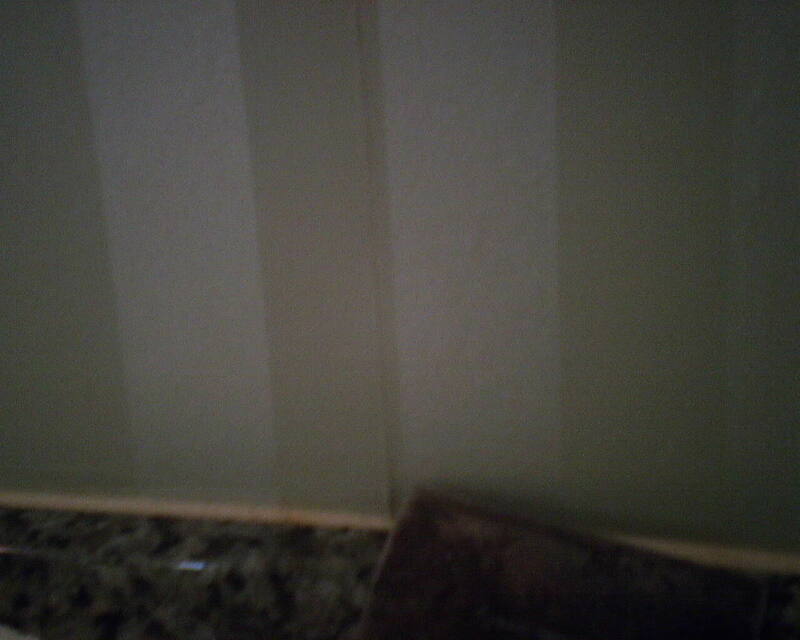 My camera ate pics of three of the rooms, so you have only this mossy green stripe combined with a coordinating faux finish accent wall – topped with a topiary themed border. Gee – NO ONE is doing borders these days. The paper has to go! 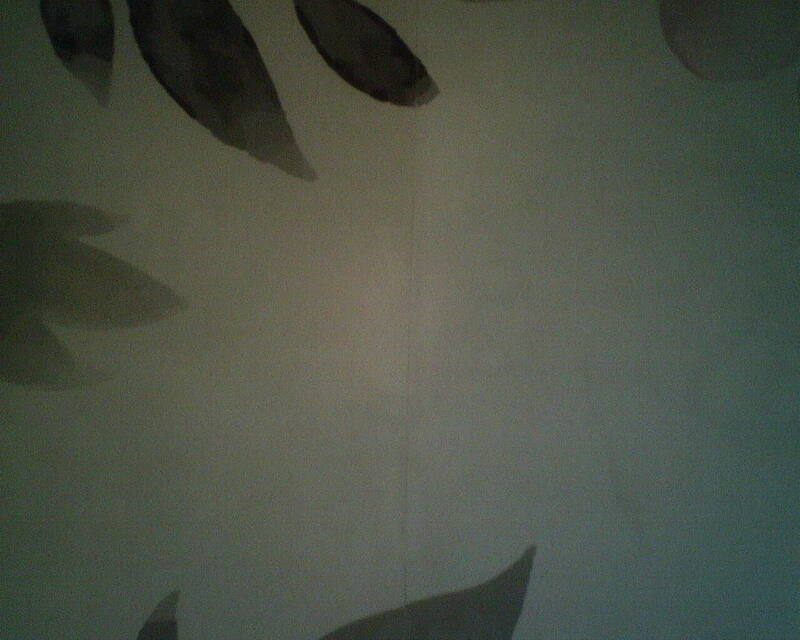 So, today I am stripping off paper that I hung in 2001. 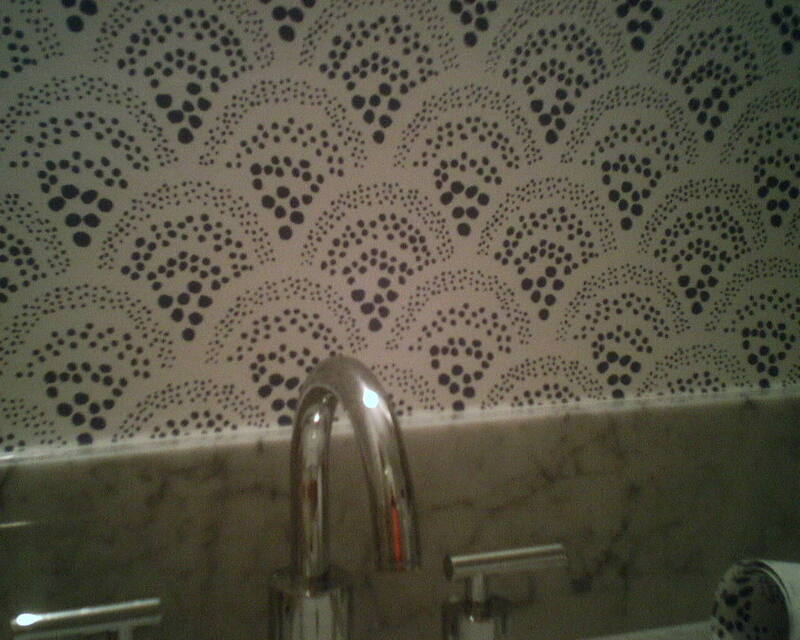 I am proud to say that every wallpaper in every room I did 16 years ago is still in absolutely perfect condition, even in the humid bathrooms. 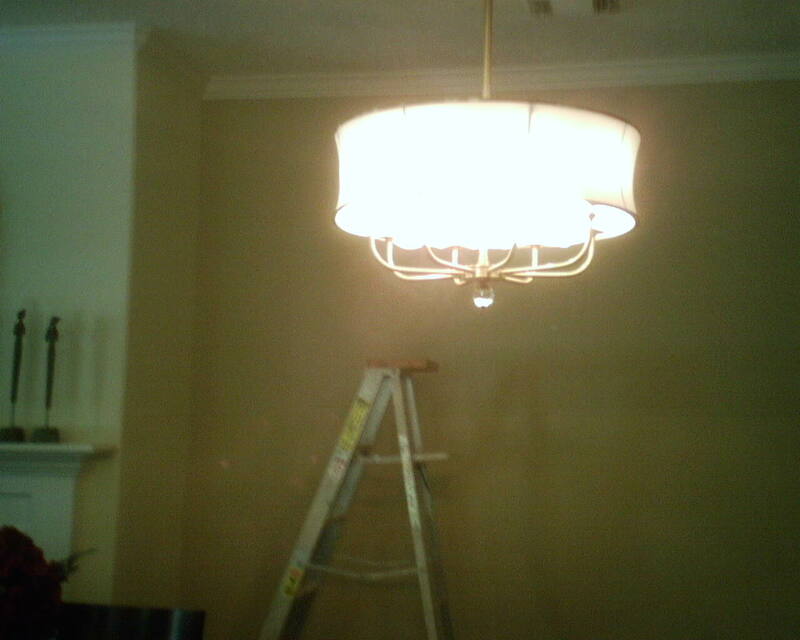 This job went especially well, since I used a good paste and because I had primed the wall with an excellent primer, oil-based KILZ Original. 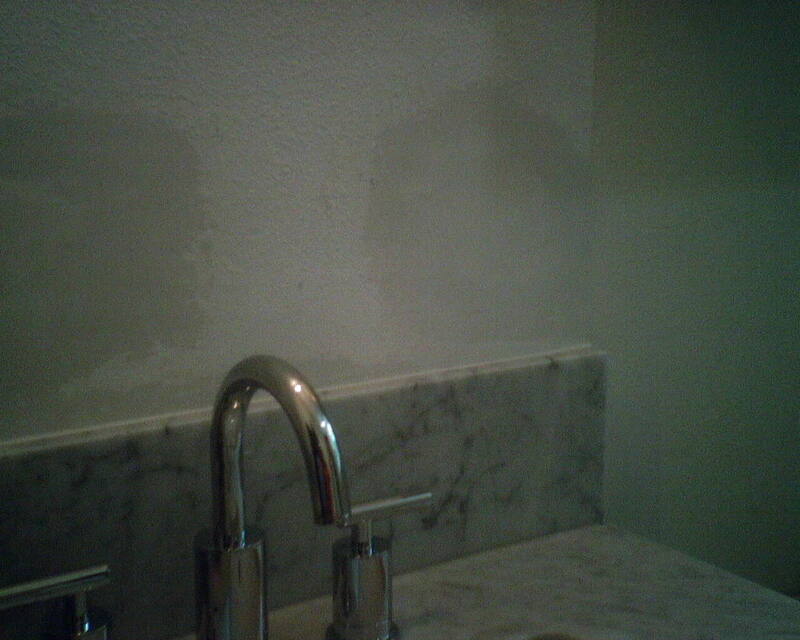 I was able to remove the paper in three bathrooms in just a few hours, with virtually no damage to the walls, because the KILZ protected them. 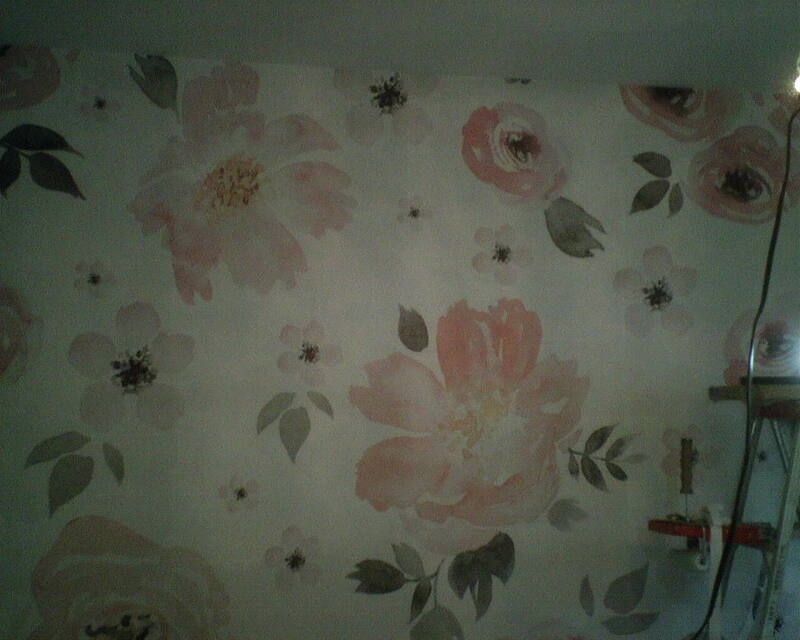 Because KILZ Original is oil-based, it will not re-wet when wallpaper paste is put on top of it, or when water is used to remove old wallpaper. NOTE: The formula for KILZ has changed in recent years, due to environmental regulations. 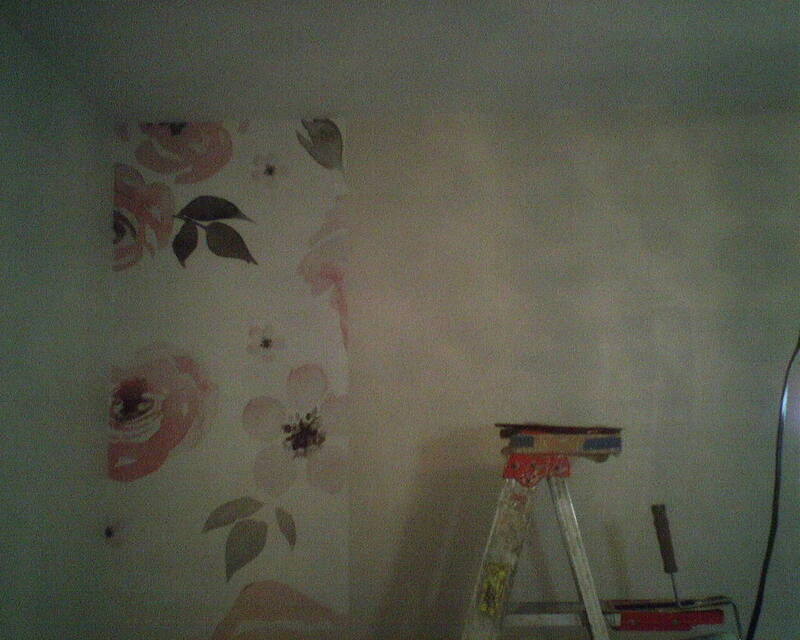 Wallpaper paste won’t adhere to it, so it is no longer a good primer for wallpaper projects. 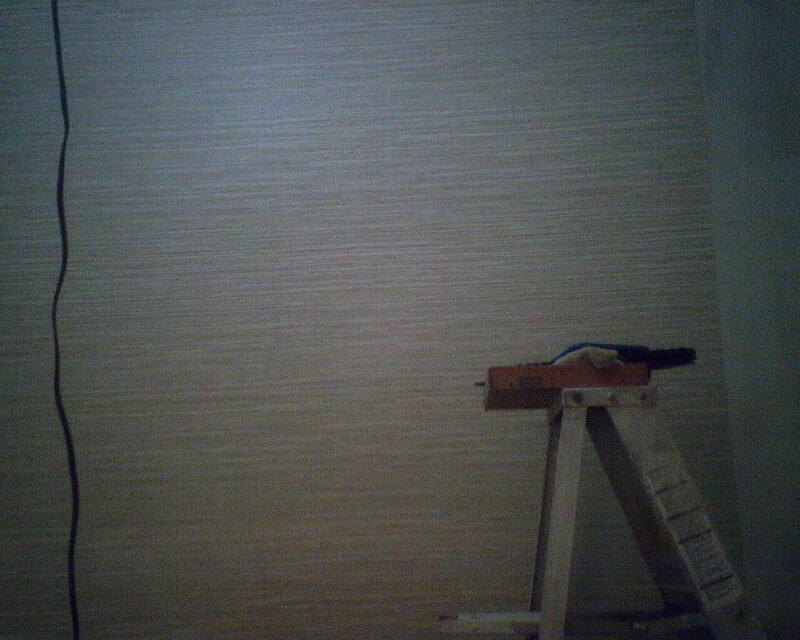 In the second photo, I am stripping off top vinyl layer of the green striped wallpaper. 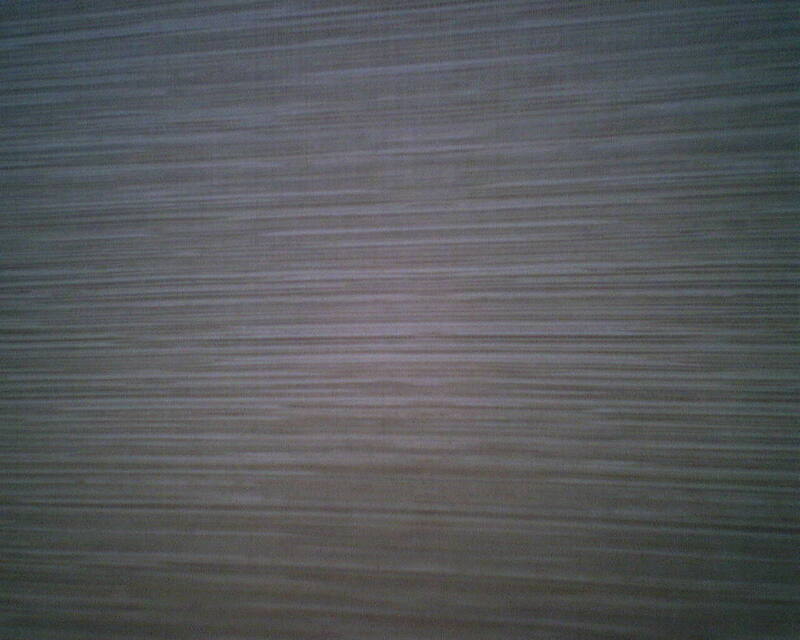 The tan colored paper backing is left on the wall. 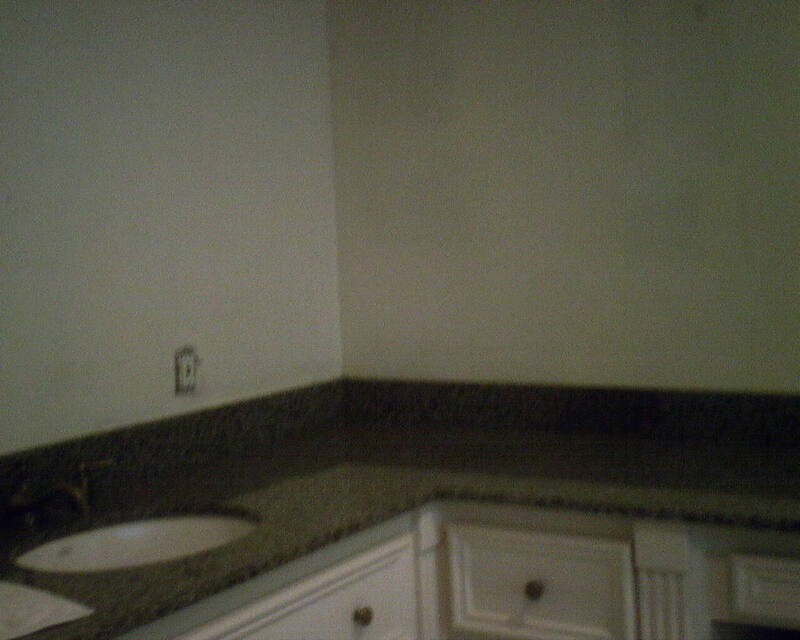 In the third photo, you see the tan backing. I have soaked some of it, and the wet areas are a darker tan color. 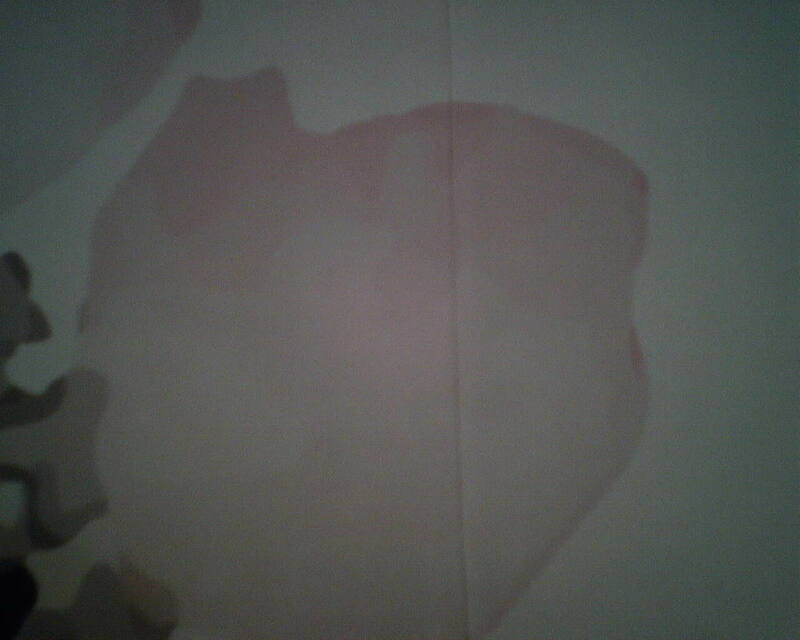 Once it gets good and wet, the paste reactivates, and the paper can be gently scraped from the wall, or, if you’re really lucky, gently pulled from the wall in large pieces. 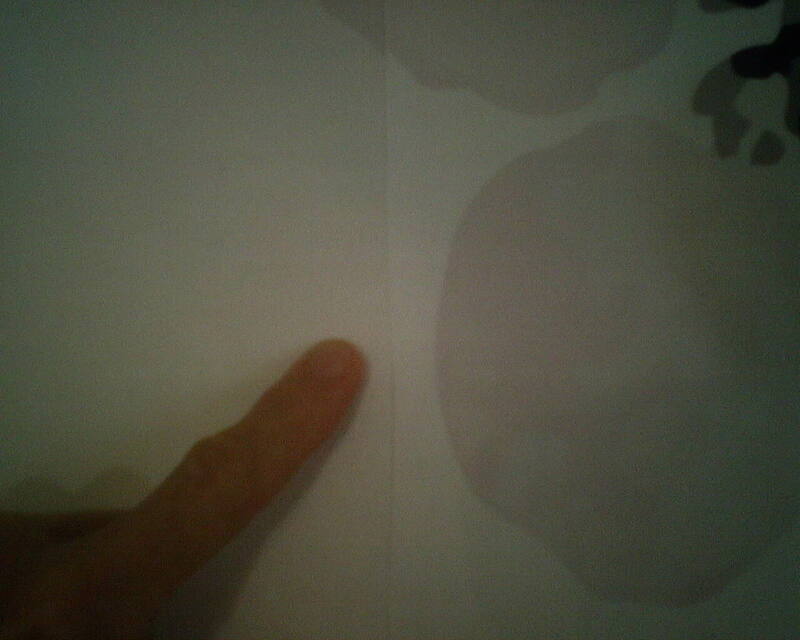 In the third photo, the white area in the center is where the paper backing has been removed, revealing the KILZ primer underneath. It was fun to also find my measurements and notes written on the wall back in 2001. 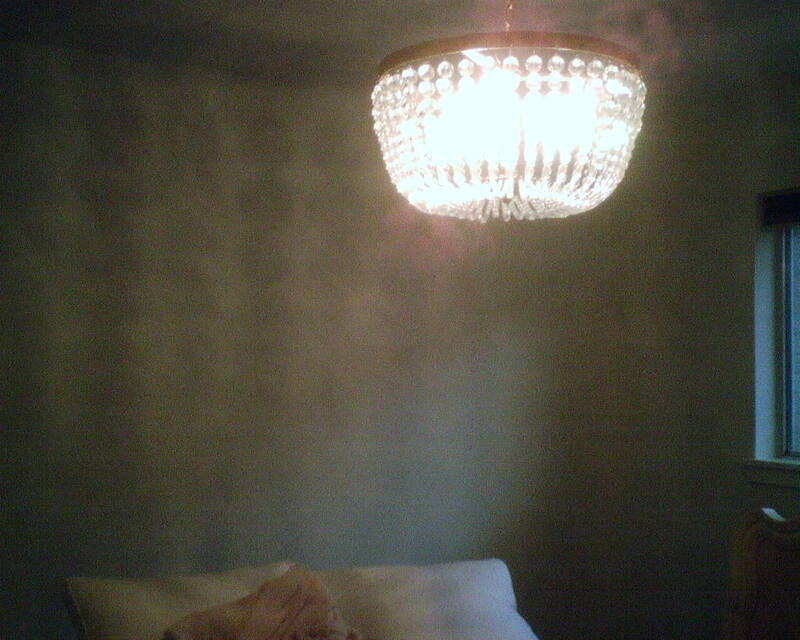 See the next post for a pic of the room with the paper off. The realtor walked in and was very happy. Next the painter will prime with a stain-blocking primer (like oil-based KILZ Original or Zinsser’s BIN) to prevent residual wallpaper paste from causing the new paint to crackle and flake off, and then paint the walls. You are currently browsing the Wallpaperlady's Blog blog archives for June, 2017.